Jarrett Bay Boatworks recently began construction on Hull # 61, a 46’ Walk-Around Express set to deliver in 2015. 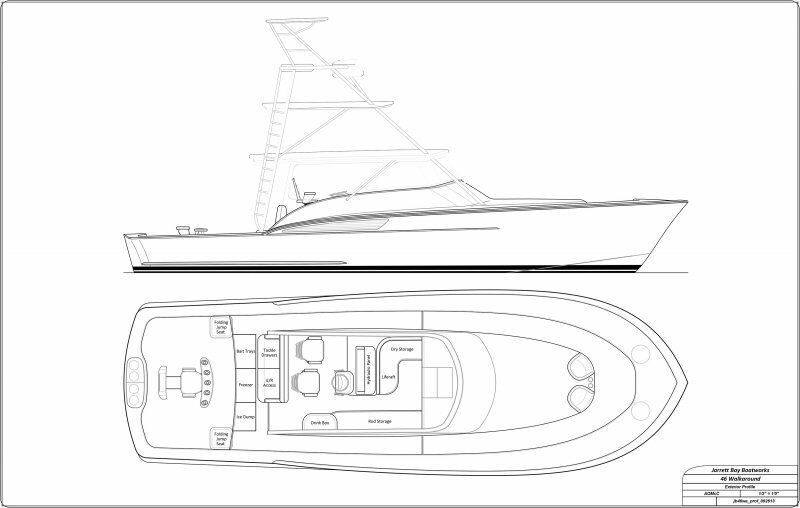 The most recent build to commence, this custom sportfish will be powered by Cat C-18s with conventional propulsion. To be used as a tender and day fishing boat by her owner, an innovative new transom shape has been designed to achieve bar-raising back-down performance while fighting a major bite from her expansive 122 sq. ft. cockpit. The new transom shape – being kept under lock and key for now, combined with Jarrett Bay’s proven hull design will represent the ultimate refinement of shapes and lifting surfaces optimized to enhance the boat’s exceptional power-to-weight ratio. In addition to time on the water being maximized for her new owner, they will also earn a premium in the used boat market when they are ready to move up to their next Jarrett Bay as demand for more efficient boats tops the search criteria for buyers. Next to peak performance, the secondary objective for this build is 360-degree fishability and visibility. The 46’ Walk-Around Express delivers beyond-ample open-view seating with twin captain’s chairs, and bench seating center-to-port and along the starboard side of the helm. Whether the action is in the cockpit or walks an angler to the bow, guests can be in the moment with a mezzanine sofa aft and Jarrett Bay’s signature bucket seats with built-in cup holders in the bow. This 46’ layout offers up thoughtfully designed storage for rods, tackle & provisions in every possible space. Under the mezzanine bench and raised deck, you’ll find two ice boxes, a drink box, tackle drawers, bait trays, gaff tubes and rod storage. In the cockpit, twin 60” x 24” fish boxes parallel the fighting chair that faces the live well with two tuna tubes in the transom. Below, Jarrett Bay’s world-renowned craftsmanship will be exemplified in the exquisite wood joinery found throughout the galley, full head, dinette and v-berth. And above, she will be complemented by a Bausch American Tower to top off this truly custom, no-nonsense build for ideal inshore and offshore versatility.